New York City Parents are organizing The Children’s March for Kindness + Kids Speak Out on December 11th at 12:30 pm in Central Park in NYC. The purpose of this event is to empower children who have been upset by the recent election by enabling them to experience the positive change that they can make in their world when they stand up and speak out for their values in community. The March will be followed by a Kids Speak Out, where children will speak from the bandshell stage on their thoughts and feelings about this election. We will also have a musical performance with Broadway singers, a children’s choir performance, sing-alongs, a reading by children’s author RJ Palacio from her award-winning novel Wonder, and distribution of Be Kind postcards that the children can write on and send to Donald Trump. We want kids of all ages to be part of this March + Speak Out, with teens taking active roles, including serving as Marshals at the parade. 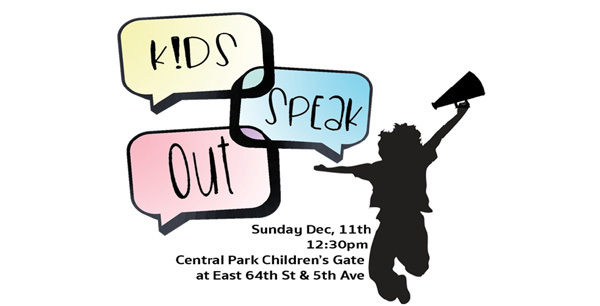 We hope to see many of you on Sunday December 11th at 12:30 pm in Central Park, marching together with our children, and demonstrating the values of inclusion, kindness, diversity, curiosity, and openness that are the true bedrock of our city and country.